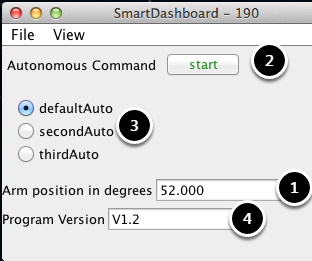 SmartDashboard uses NetworkTables to send data between the robot and the Dashboard (Driver Station) computer. NetworkTables sends data as name, value pairs, like a distributed hashtable between the robot and the computer. When a value is changed in one place, its value is automatically updated in the other place. This mechanism and a standard set of name (keys) is how data is displayed on the SmartDashboard. There is a hierarchical structure in the name space creating a set of tables and subtables. SmartDashboard data is in the SmartDashboard subtable and LiveWindow data is in the LiveWindow subtable as shown below. For informational purposes the names and values can be displayed using the OutlineViewer application that is installed in the same location as the SmartDashboard. It will display all the NetworkTable keys and values as they are updated. The "Arm position" is created with the putNumber() call. The AutonomousCommand is written with a putData("Autonomous Command", command) that is not shown in the above code fragement. The chooser is created as a SendableChooser object and the string value, "Program Version" is created with the putString() call. 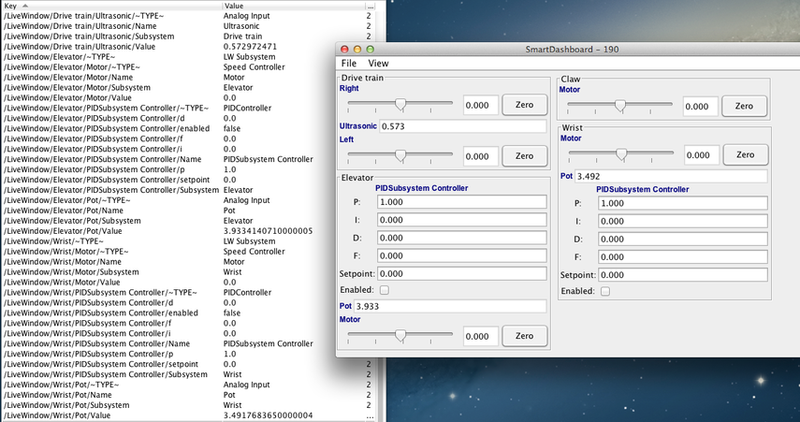 The code from the previous step generates the table values as shown and the SmartDashboard display as shown here. The numbers correspond to the NetworkTable variables shown in the previous step. Values that correspond to actuators are not only displayed, but can be set using sliders created in the SmartDashboard in Test mode.